The Last Days of Night opens with a harrowing scene. Paul Cravath, a young lawyer freshly out of Columbia, witnesses a man being burned alive in the wires above busy Broadway. The man is a Western Union lineman who dies horribly trying to repair an electrical problem that he obviously has no training for. Paul, through a series of coincidences he really can't explain, has but one client, George Westinghouse. George Westinghouse and Thomas Edison, "the Wizard of Menlo Park", are locked in an epic battle over which of their companies will gain control of the electrification industry. The contention is over the power itself and the patent on the incandescent light bulb; Westinghouse is a proponent of Alternating Current (AC) and Edison has sunk everything into Direct Current (DC). Thomas Edison has used every trick in the book to discredit AC as dangerous in the eyes of the public, going so far as filing no less than 312 lawsuits against Westinghouse for patent infringement. Not to mention the infamous electrocution of Topsy the elephant and a horribly botched legal execution. Whichever man wins this legal battle will gain wealth and acclaim beyond imagining. The story introduces us to many famous people with a stake in the outcome, Thomas Edison, George Westinghouse, Nikola Tesla, Alexander Graham Bell and JP Morgan. This is definitely not the benevolent grandfatherly Edison I learned about in grade school. This Thomas Edison is obsessed by winning at all costs and addicted to fame. It almost seems that he would like to be credited not only for inventing the incandescent light bulb, but also for just about everything invented in the US, past, present and future. Westinghouse seems to not be interested in fame but has an uncommon drive to make the best products. Both men think that Nikola Tesla's eccentric genius can help them iron out the problems inherent in both currents. The problem is that Tesla is completely uninterested in marketing anything. Alexander Graham Bell is the only man to ever beat Edison in court and JP Morgan is as alway interested in profit above all. 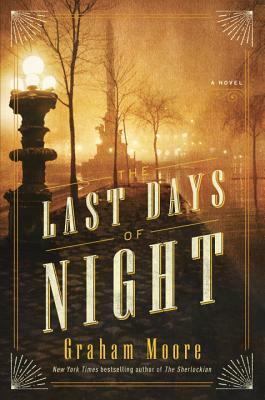 The Last Days of Night is a legal thriller as well as a meticulously researched historical novel about a largely forgotten episode in American history. Graham Moore has pulled together the known facts about the famous men and managed to paint them as real human beings. I am the first to admit my ignorance of electrical engineering but I was somewhat more enlightened without being overwhelmed. The Last Days of Night succeeds most as a study of ambition; what are we willing to do to realize our dreams? The young lawyer Paul Cravath finds that it is possible to lose the battle and win the war, at least in this particular litigation.